Dopyaza was a dish made using a lot of onions (apparently double the onions than meat) at my place and it had a few vegetarian versions too. Alu dopyaza was most common as an additional curry and parwal dopyaza was made during summers when we all wanted something spicy yet light. Paneer dopyaza was the easiest paneer curry that tasted yum with just about anything. The good thing is, the basic cooking procedure and spices are the same in all these dopyaza type recipes. Only cooking time changes with the main ingredient used. 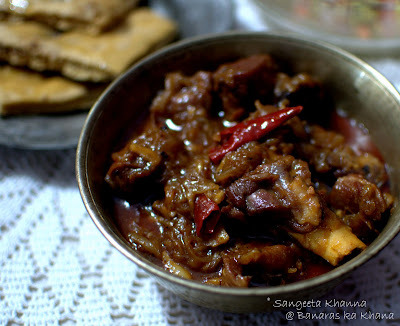 I must add the nomenclature of a dopyaza is probably disputed as some people say dopyaza is a curry where meat and vegetables are cooked together and there is no link with the amount of onion used. In our family, it was a pyaz (onion) connection only that we knew. So doguna pyaz...double the onion it is for us. This mutton dopyaza recipe would make a few of my friends happy as they have been asking for more non vegetarian recipes to be posted. 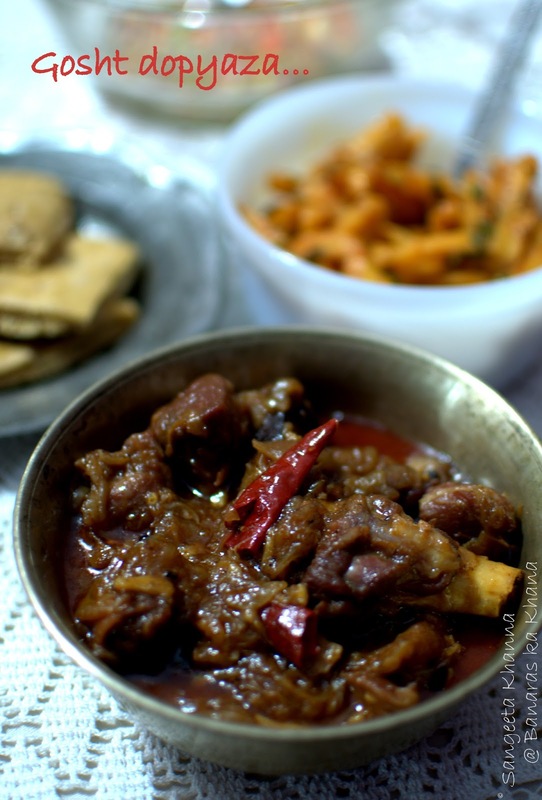 I am guilty of infrequent posts and rare non vegetarian recipes already, found these pictures in the old albums and decided to post the recipe quickly. 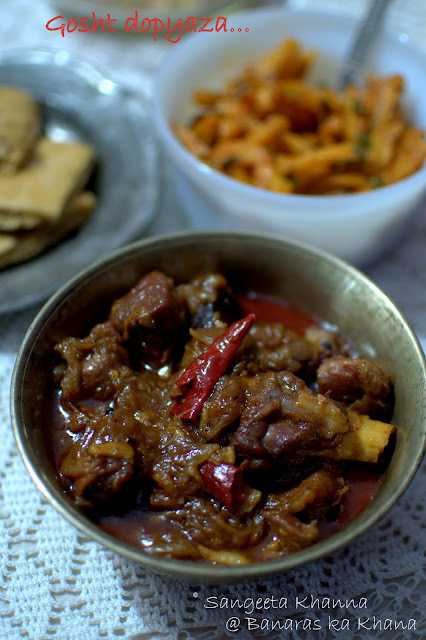 The recipe is slow cooked, so takes about an hour and some more to cook but you don't need to do much preparation for this curry especially if you are chopping the onions in the food processor. This is a gravy type curry but the gravy is not uniformly creamy. The onion caramelize during the slow cooking process and cook to become a smooth coating around the meat. The fats separate after the long cooking time and the spices lend their aroma to every single fiber of meat. This is the uniqueness of this recipe, the onion rich gravy that is a bit sweetish yet heavy with the aromatic spices. Heat can be controlled by adjusting the quantities of chilies, black peppercorns and ginger. All three provide a depth of heat in this curry, where onion has lend enough sweetness to round up the spices. The dry red chilies lend a very nice flavor to this onion-centric curry so the use is very important. Do not replace red chilies with green chilies in this recipe and I suggest you use more red chilies than you think will be enough, as the amount of onion neutralizes the chilly heat quite a bit. If you don;t want the heat, just empty all the seeds and discard, the aroma of chilly will be nice that way, without making the curry too hot. Crush the spices lightly, not disintegrating them in the process. You just need to macerate the spices while cooking, so a light handed pounding will be enough. Heat oil or ghee in a thick base pan or kadhai. I normally use my handi shaped pressure cooker pan and do the cooking without using the pressure lid. It is a slow cooked dish so takes about an hour and half, be prepared to do some more chores around the kitchen in the meantime. Add the red chilies, ginger and garlic to it and wait till everything gets aromatic and the color changes a bit. No more than 30 seconds and then tip in all the onion and the whole spices that you have crushed lightly. Add the salt too and keep stirring on medium heat till the onion starts getting pinkish. Add the meat, mix well, cover and cook for 10 minutes. Stir and mix, cover and cook on lowest flame. Keeps stirring after every 10 minutes and place an iron skillet (or tawa) below the cooking pan if you think the curry might stick to the base. It has never happened with me so relax, it's not a possibility if you are using the right pan. The curry is done once the fats are separated and the meat is cooked through. The onions are almost homogenized by now and make a nice gravy without a drop of water being added to the curry. Serve with any chapati or paratha or naan. We had it with mixed grain kulcha and a pumpkin and mint stir fry salad. The kulchas were ignored royally until we needed a few bits of it to polish off this dopyaza gravy. This curry is so aromatic that you would start feeling hungry as soon as it arrives at the table, and would would be guilty of tasting a few chink of eat if you are cooking it. A statutory warning. Do let me know whenever you try this eastern UP style dopyaza. Some people call a similar recipe Ishtoo but they add some more spices in it and make it a bit runny. Ishtoo is made when someone needs a soup like curry during a flu or cough and cold or during rainy season. But no seasonal constraints for healthy people who can have it any time. True on the Dopyaza term! :-) though I would like your version too! Very Tempting Sangeeta! Love dopyaza recipe's too but the frying and the circulating the aroma around the closed house makes one reach out for a quick tadka!!! I like the PC-lidless cooking and it comes out really well, without toughening the meat. is Ishtoo not Stew? Meat/vegetable with basic whole spice / onions or what have you? Thanks for the recipe..tasted great.